Looking to get your dose of adrenaline? Kyrat offers a ton of activities to sate your inner adrenaline junkie. Throwing yourself off a cliff in a wingsuit. Parachuting. Zip lining. Hunting. The possibilities are practically endless for the daredevils. At least more than enough to fill the time until your tourist visa runs out. A weirdly popular activity is climbing. I cannot claim that everyone is a climber there, but according to all the grappling spots, it must be so. If you are an engine-driven adrenalinist, a vehicle is not longer than a stones throw away. There is no one enforcing traffic rules there, so you can drive according to your abilities (or lack of). There is almost always some fun in fraternizing with the locals. Dancing, for an instance, an instant bond-maker. Serious army guys like to have fun too. If you’re not into mingling with the army, get into some combat training with the rebels. For the more advanced fighter, you’ve got a lethal exciting arena filled with contenders to test your abilities. If this doesn’t get your blood rushing, nothing will. Be sure to get a few practice rounds before entering. For you not-so-martial explorer types, there’s ‘Orienteering’ with the Golden Path. You’ve just seen some of the things you can do. Get over there and check out all the awesome stuff you can do. Kyrat is not only for adrenaline-craving madmen. There’s lots to see as well. 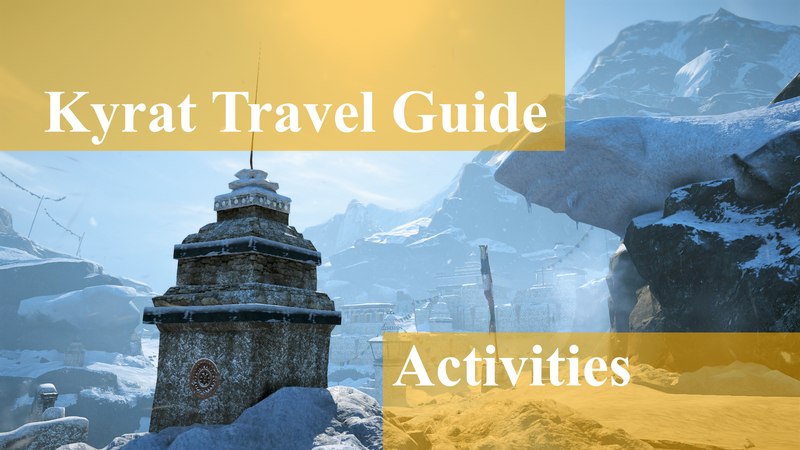 For individuals not requiring breakneck action at every possible moment, there’s a lot of sightseeing to do.